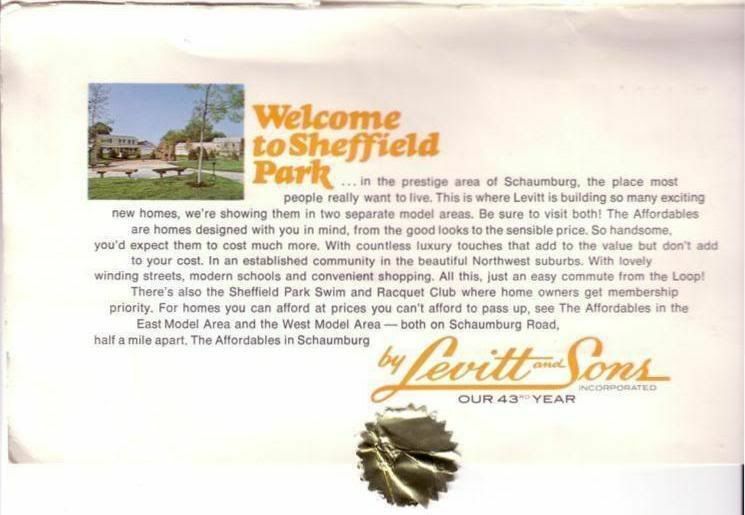 is Levitt's second community in Chicagoland's northwest suburbs. 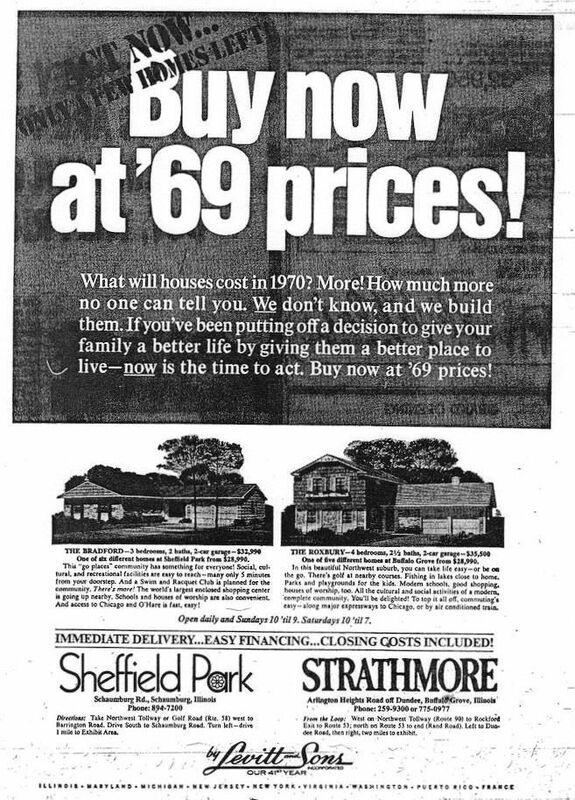 Having successfully entered the Mid-West real estate market with Strathmore at Buffalo Grove, Levitt was now ready to take housing communities a step further. 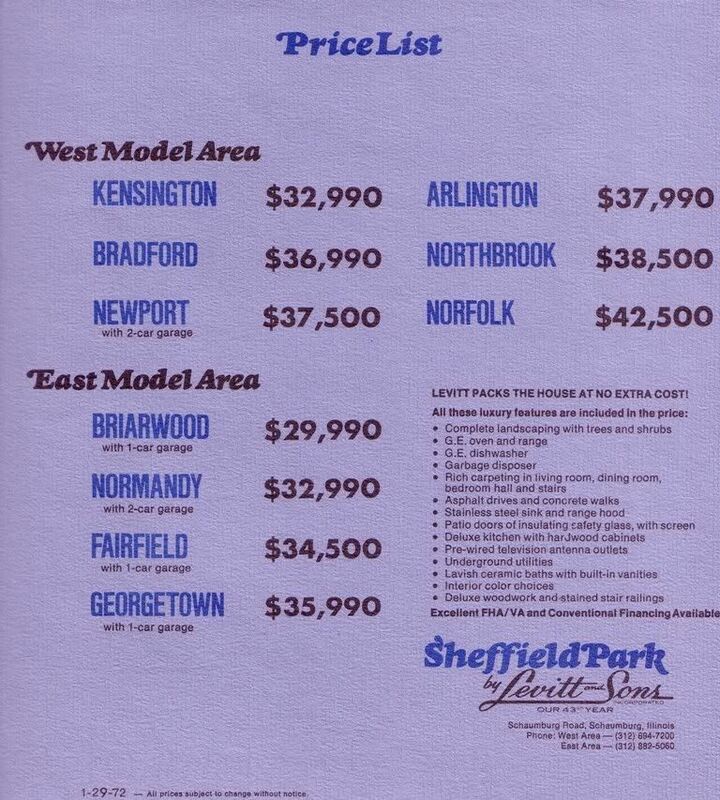 Sheffield Park quickly became a more diversified community, in line with Levitt's other communities at the time, such as Willingboro and Belair, eventually incorporating townhomes and manor homes into the overall plan. 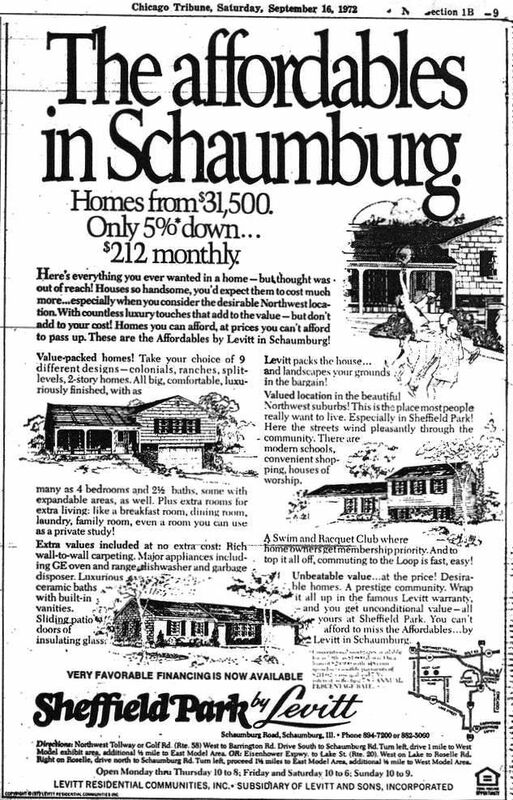 S C H A U M B U R G , I L L .
Location: Village of Schaumburg in Cook County, Ill. 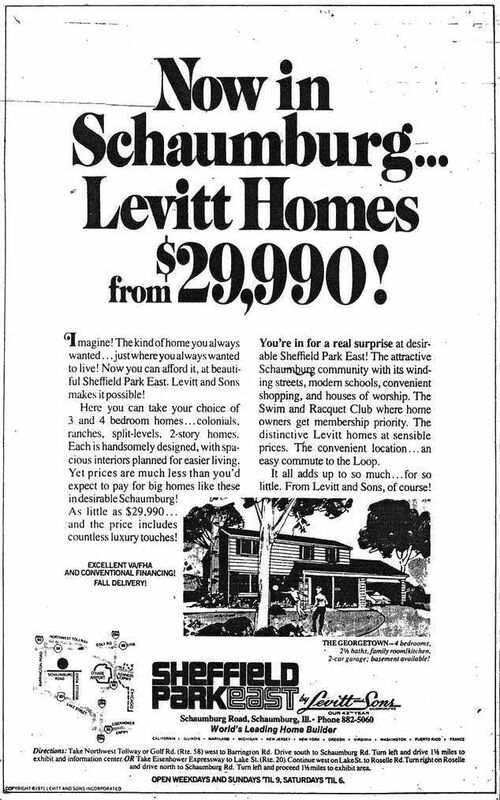 Constructed by Levitt and Sons, Inc. (Delaware), and Levitt Residential Communities, Inc.
Open for sales May 24,1969. 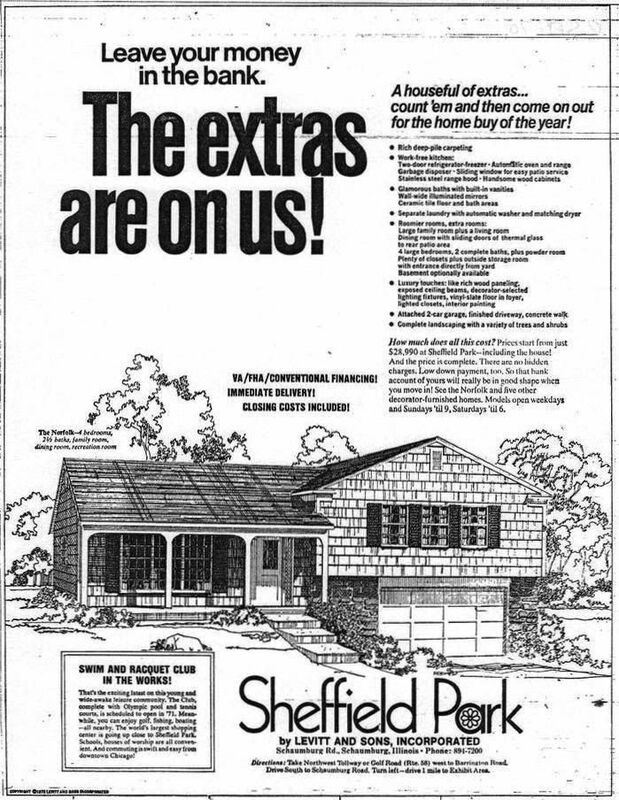 Sheffield Park Exhibit Center and sample homes located on Shakespeare Court off Essex Court and Schaumburg Road. 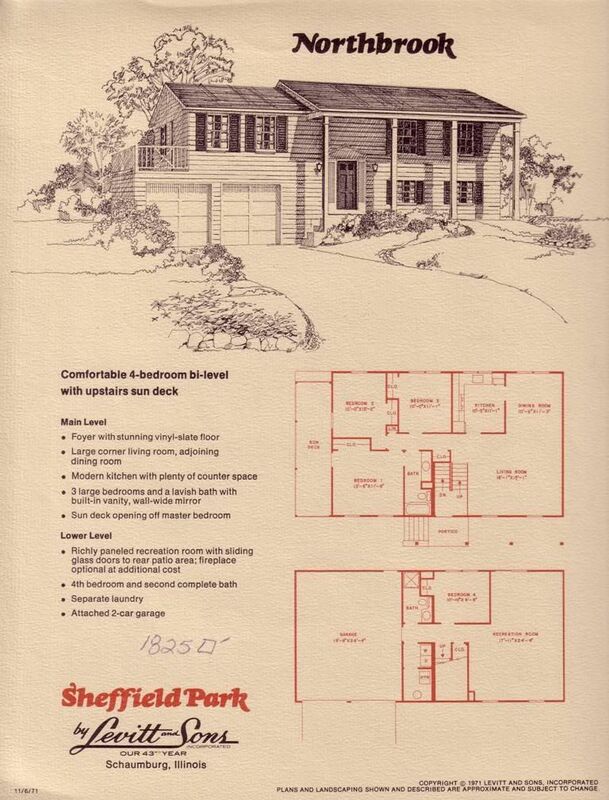 Additional Sheffield Park sample homes later constructed on Essex Court. 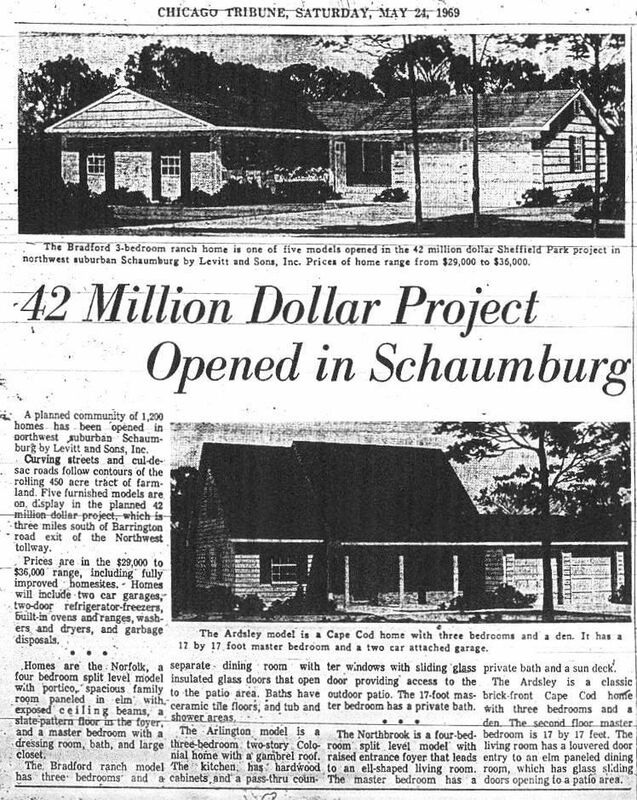 Official web site for the Village of Schaumburg. Tour all five sample homes in the brand new community of Sheffield Park! 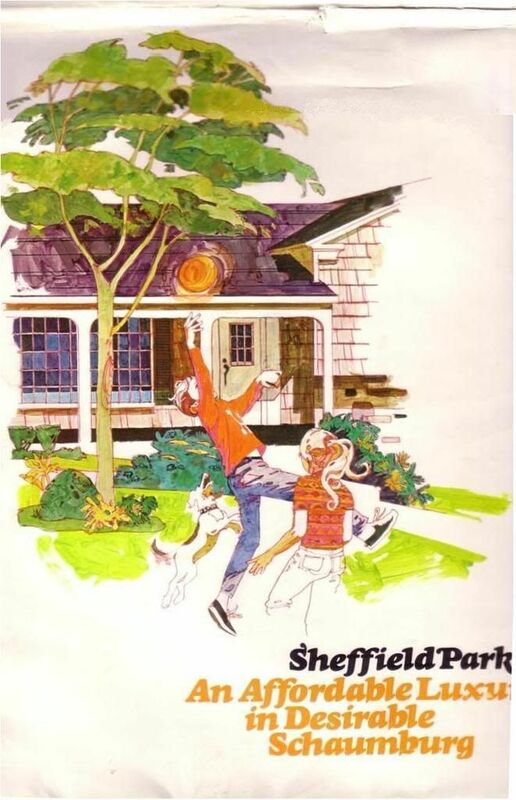 Sheffield Park homes come complete with Two-car Garage, Vinyl-Slate Entry Foyer, Lighted Closets, and Kitchen and Laundry Appliances including Self-Cleaning Oven, Dishwasher, and Disposal on fully landscaped quarter-acre homesites. 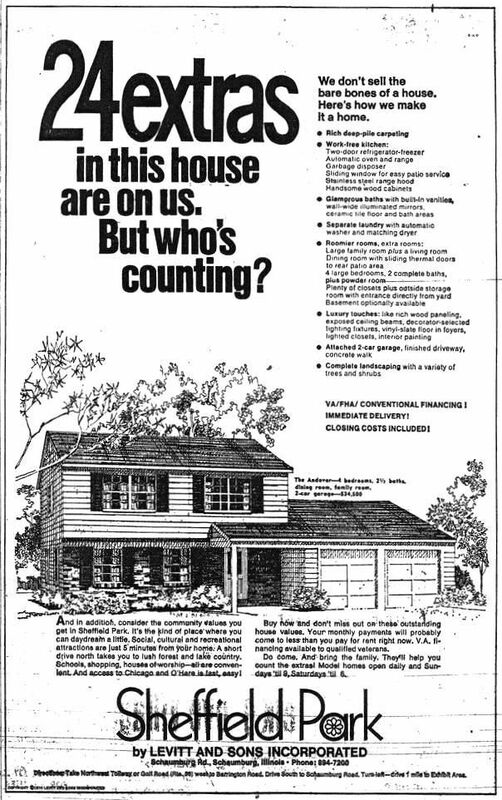 Even closing costs are included in the sale price! 1-1/2 Story (Cape Cod). 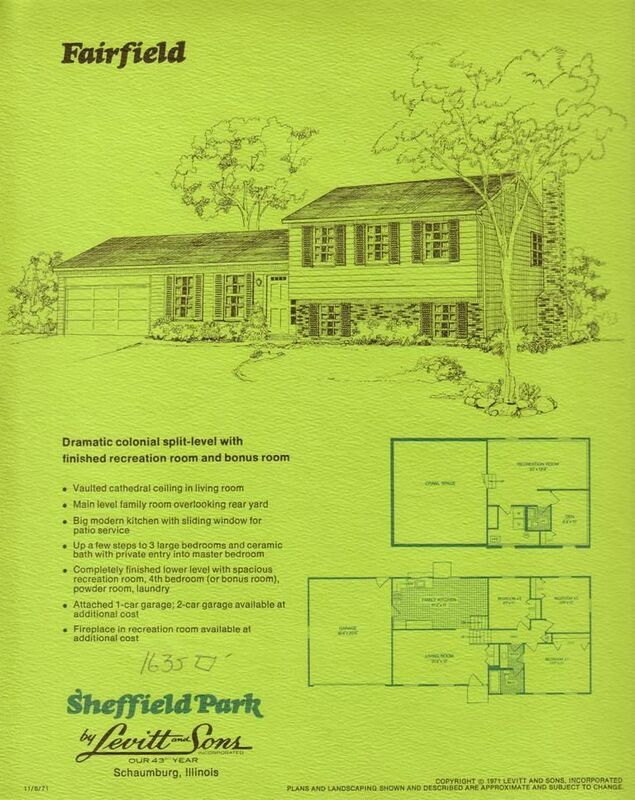 4 Bedrooms, 2 Baths, Covered Entry with Brick front, Elm-Paneled Formal Dining Room with Sliders to back lawn and Serving Counter from Kitchen, Laundry-Utility Room with Garage access, Two-car Garage with Overhead Storage and Pull-down Stairway. Side-hall Colonial with Gambrel Roof and Shed Dormers. 3 Bedrooms, 2-1/2 Baths, Brick front, Vinyl-Slate Entry Foyer, Formal Dining Room with Sliders to patio and back lawn, Eat-in Kitchen with spindle partition to Dining Room and pass-through counter to patio, Family Room with Beamed Ceiling, Laundry-Utility Room, Optional Fireplace in Family Room, Optional Basement, Two-car Garage with Overhead Storage and Pull-down Stairway. Rancher. 3 Bedrooms, 2 Baths, Cut Stone front, Covered Entry, Vinyl-Slate and Elm-Paneled Entry Foyer with oversized Guest Closet, Corner Living Room, Rear Family Room with Sliders to back lawn, Front-to-Rear Kitchen-Dining Room with Serving Counter, Laundry-Utility Room with Garage access and Service Door to back lawn, Optional Fireplace in Living Room, Optional Basement, Two-car Garage with Storage Area plus Overhead Storage with Pull-down Stairway. Split-Level. 4 Bedrooms, 2 Baths, Partial Cut Stone front, Entry Portico, Vinyl-Slate Raised Entry Foyer with Lavatory and Guest Closet, Front Elm Paneled Family Room with Beamed Ceiling, Kitchen with Serving Counter to Family Room, Rear Living-Dining Room with Sliders to back lawn, Upper Hall with two Linen Closets, Main Bath with separate Vanity and Bath areas, Master Bedroom Suite with Dressing Area and Walk-in Closet, Lower level Recreation Room, Lower level Laundry and Utility areas, Optional Fireplace in Family Room, Two-car Garage. Bi-level. 4 Bedrooms, 2 Baths, Entry Portico, Vinyl-Slate Entry Foyer, Formal Dining Room, Eat-in Kitchen, Master Bedroom with outdoor Sun Deck and entry to Main Bath, Lower level Wood-Paneled Front-to-Rear Recreation Room with Sliders to back lawn, Lower level Bedroom and Bath, Laundry-Utility Room, Garage Access, Oversized Two-car Garage with Service Door to back lawn. 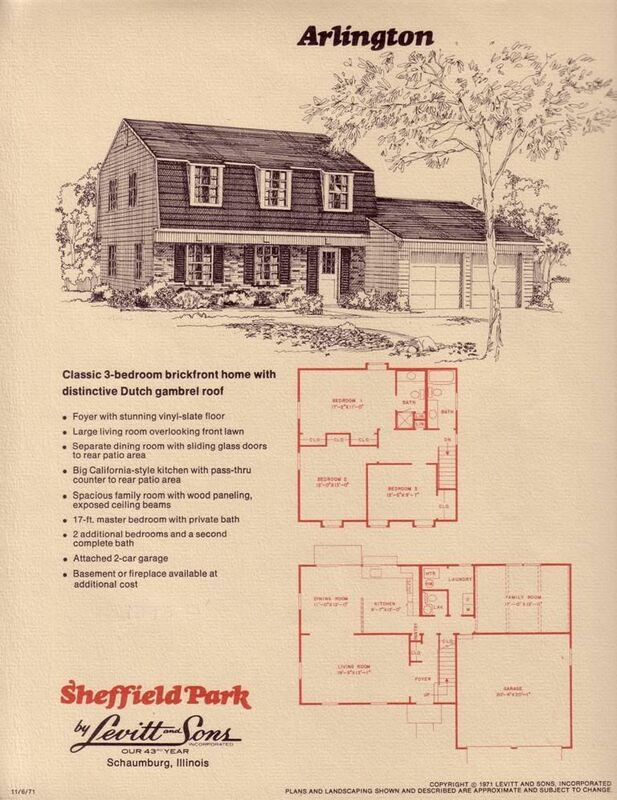 In addition to the 1969 homes offered at Sheffield Park, tour these four new models added to the houseline. Side-hall Colonial. 4 Bedrooms, 2-1/2 Baths, Covered Entry with brick front, Vinyl-Slate Entry Foyer, Formal Dining Room with Sliders to patio and back lawn, Eat-in Kitchen with spindle partition to Dining Room and pass-through counter to patio, Family Room with Beamed Ceiling, Laundry-Utility Room, Optional Fireplace in Family Room, Lighted Closets, Optional Basement, Two-car Garage with Overhead Storage and Pull-down Stairway. Rancher. 3 Bedrooms, 2 Baths, Entry Portico with dentil finish and brick front, Formal Dining Room with Sliders to back lawn, Eat-in Kitchen with Pantry and windowed countertop work area, Laundry-Utility Room with Garage access, Lighted Closets, One-car Garage with Overhead Storage and Pull-down Stairway. Split-Level. 4 Bedrooms, 2 Baths, Double-Door Front Entry, Formal Dining Room, Eat-in Kitchen with Service Door to back lawn, Master Bedroom with entry to Main Bath, Main Bath with Linen Closet, Lower level Family Room, Lower level Bedroom and Bath, Laundry-Utility Room, Oversized Two-car Garage with Service Door to back lawn. 1-1/2 Story. 3 Bedrooms, 1-1/2 Baths, Vinyl-Slate Entry Foyer, Rear Living Room with Sliders to back lawn, Kitchen-Family Room with corner windowed countertop area, Laundry-Utility Room with Garage access, Upper level expansion area with space for two additional Bedrooms and Bath, Lighted Closets, One-car Side-Entry Garage with Service Door to side lawn, Optional Two-car Front-Entry Garage. 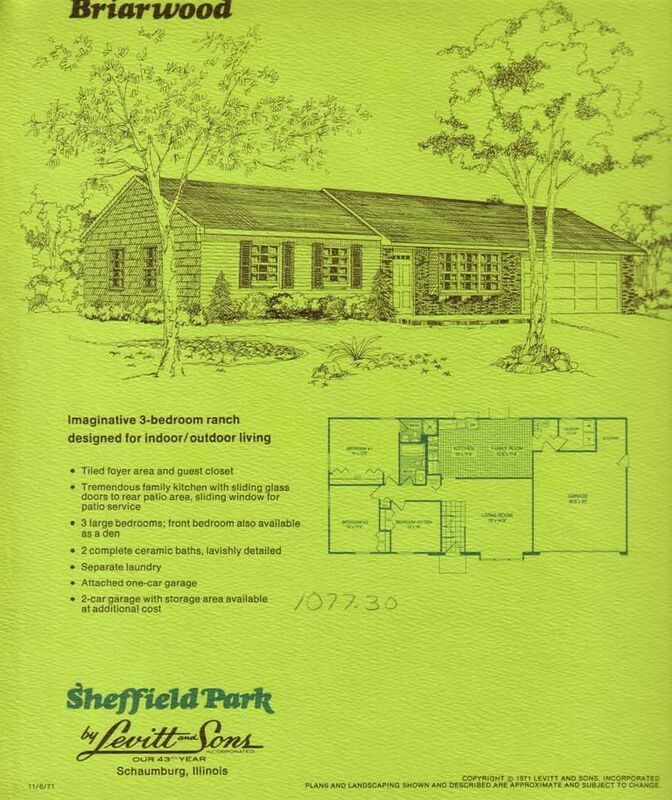 View the vibrant Cover introducing Schaumburg's Affordable Luxury community, Sheffield Park. 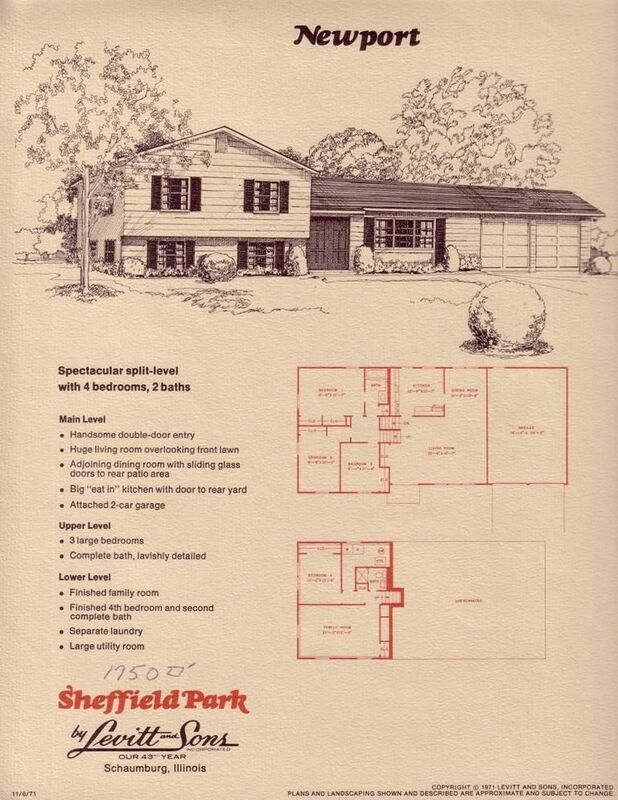 View the Community Profile for Sheffield Park. View the Price List for the homes in both the East and West model areas and see all the Standard Features included in your new home at Sheffield Park. View the list of Optional Items for the homes in both the East and West model areas. 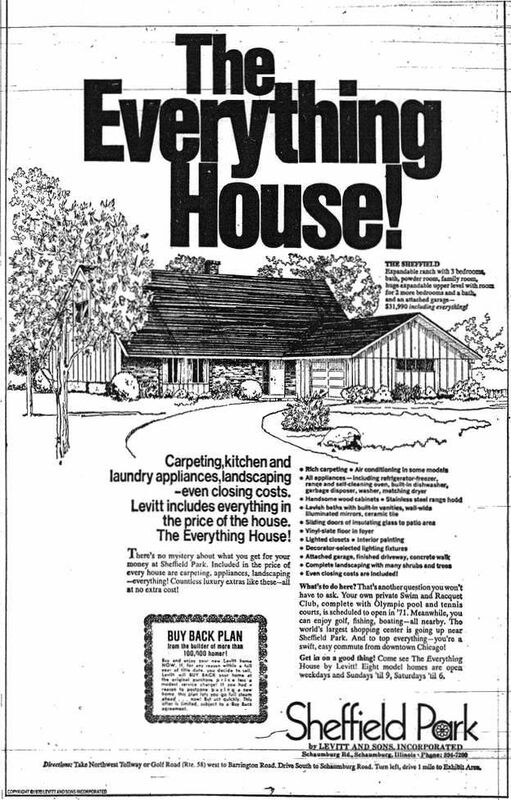 Items such as Fireplaces, Central Air-Conditioning, Storm Windows, and Kitchen and Laundry Appliances may be purchased directly from Levitt and Sons. 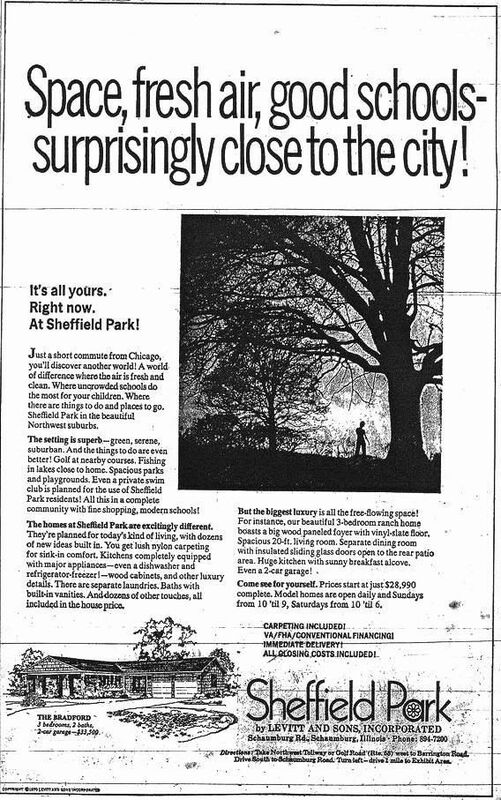 View the Location Map for the Sheffield Park Exhibit Centers and Schaumburg community--schools, houses of worship, shopping--"close to everything." 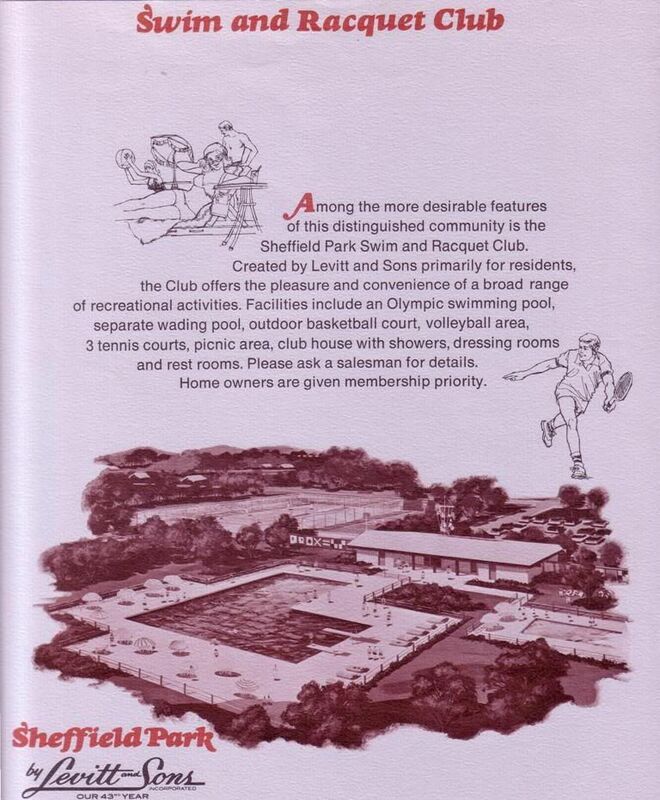 View the rendering and profile for Sheffield Park's expansive Swim and Racquet Club, created primarily for Sheffield Park residents. 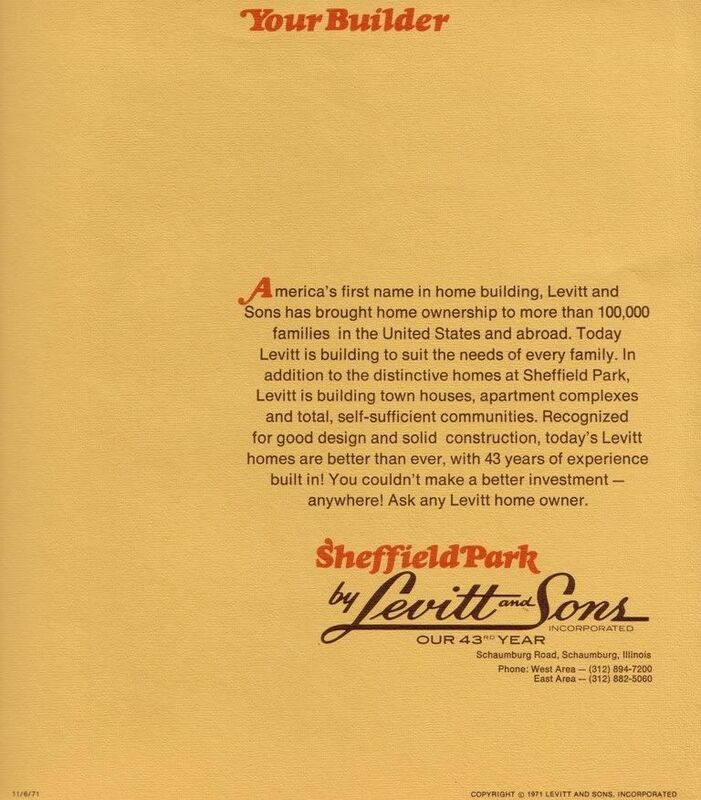 Read about Your Builder, Levitt and Sons, Inc., and the 43 years of experience that go into creating your new home and community. Tour all ten sample homes--six in the West model area plus four more in the East! Two-car garages and basements are available on select models. 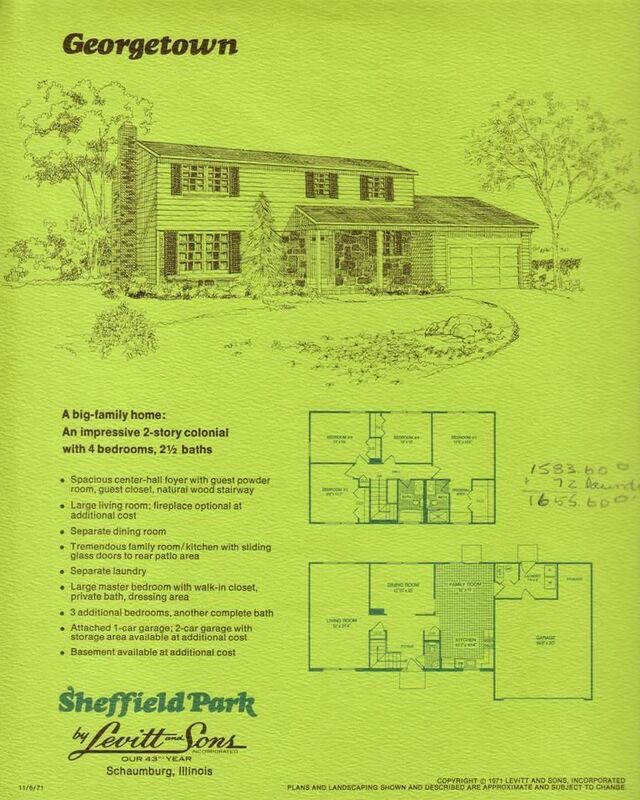 With so much variety, you'll be sure to find the home at Sheffield Park that suits your lifestyle--large family or small! Side-hall Colonial with Gambrel Roof and Shed Dormers. 3 Bedrooms, 2-1/2 Baths, Brick front, Vinyl-Slate Entry Foyer, Formal Dining Room with Sliders to patio and back lawn, Eat-in Kitchen with spindle partition to Dining Room and Pass-through Counter to patio, Wood-Paneled Family Room with Beamed Ceiling, Laundry-Utility Room, Optional Fireplace in Family Room, Optional Basement, Two-car Garage. Rancher. 3 Bedrooms, 2 Baths, Cut Stone front, Covered Entry, Vinyl-Slate and Wood-Paneled Entry Foyer with oversized Guest Closet, Corner Living Room, Rear Family Room with Sliders to back lawn, Front-to-Rear Kitchen-Dining Room with Serving Counter, Laundry-Utility Room with Garage access and Service Door to back lawn, Optional Fireplace in Living Room, Optional Basement, Two-car Garage with Storage Area plus Overhead Storage with Pull-down Stairway. Split-Level. 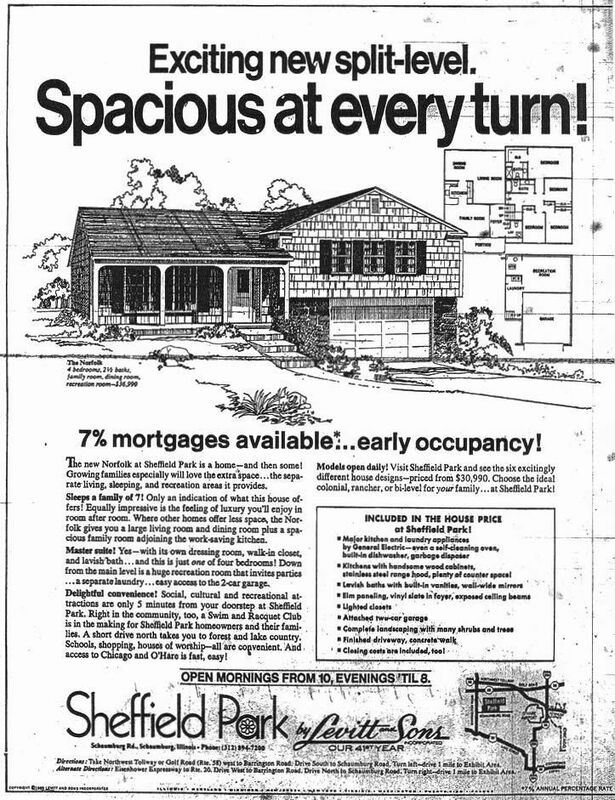 4 Bedrooms, 2 Baths, Partial Cut Stone front, Entry Portico, Vinyl-Slate Raised Entry Foyer with Lavatory and Guest Closet, Front Wood-Paneled Family Room with Beamed Ceiling, Kitchen with Serving Counter to Family Room, Rear Living-Dining Room with Sliders to back lawn, Upper Hall with two Linen Closets, Main Bath with separate Vanity and Bath areas, Master Bedroom Suite with Dressing Area and Walk-in Closet, Lower level Recreation Room, Lower level Laundry and Utility areas, Optional Fireplace in Family Room, Two-car Garage. Rancher. 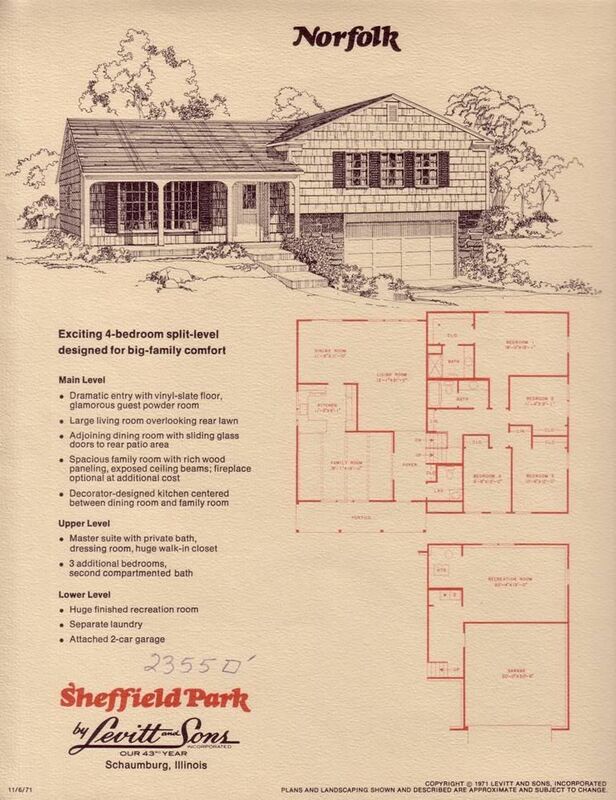 3 Bedrooms, 2 Baths, Partial Brick front, Tiled Entry area, Living Room with Box Window, Kitchen-Family Room with Pass-through Counter to patio and Sliders to back lawn. Optional Den at Bedroom 3 with doors to Front Entry area, Laundry-Utility Room with Garage access, One-car Garage, Optional Two-car Garage with Storage Area. Split-Level. 4 Bedrooms, 1-1/2 Baths, , Living Room with Cathedral Ceiling, Rear Kitchen-Family Room with Sliders to back lawn, Pass-through Counter to patio area, and Garage access, Main Bath with separate Vanity and Bath areas, Master Bedroom with entry to Main Bath, Lower level Recreation Room, Lower level Bedroom and Lavatory, Laundry-Utility Room, Optional Fireplace in Recreation Room, Oversized One-car Garage, Optional Two-car Garage. 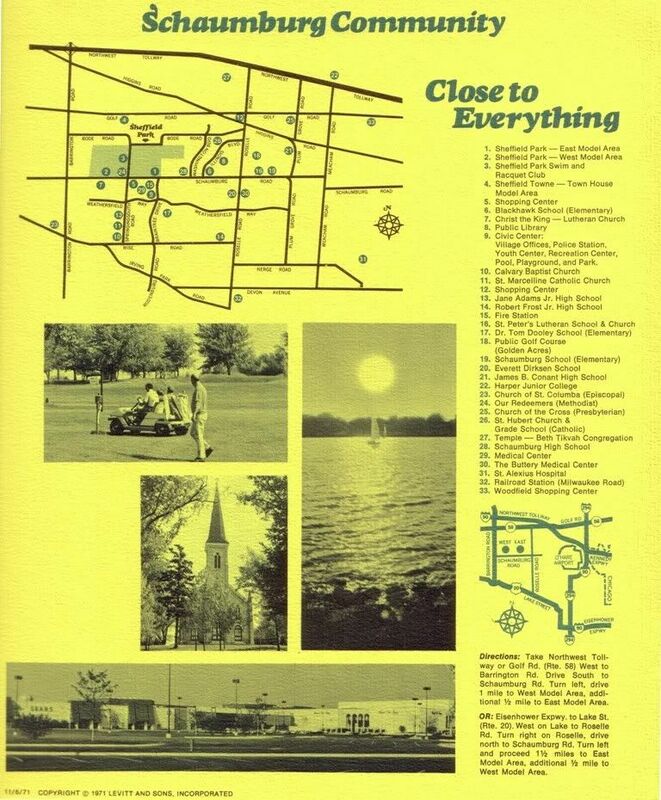 Center-Hall Colonial. 4 Bedrooms, 2-1/2 Baths, Entry Foyer with Lavatory and Guest Closet, Front-to-Rear Living Room, Formal Dining Room, Front-to-Rear Kitchen-Family Room with Sliders to back lawn, Laundry-Utility Room with Garage access, Master Bedroom Suite with Dressing Area and Walk-in Closet, Optional Fireplace in Living Room, Optional Basement, One-car Garage, Optional Two-car Garage with Storage Area. Bi-Level. 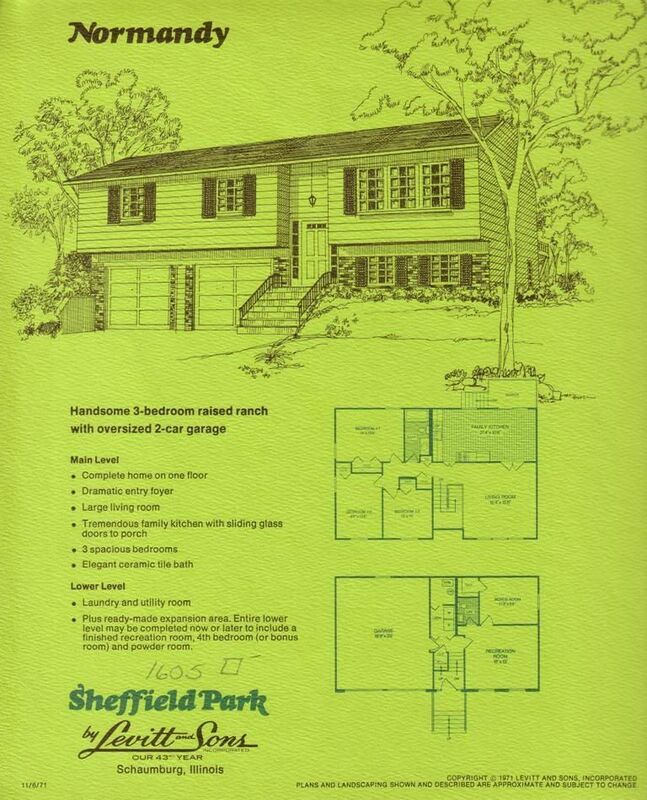 3 Bedrooms, 1 Bath, Lower level Expansion Area, Kitchen-Family Room with Sliders to Rear Deck, Rear Deck with Stairs to back lawn, Lower level Laundry-Utility Room, Garage Access, Optional Finished Lower Level with Recreation Room, 4th Bedroom with Walk-in Closet, and Lavatory, Oversized Two-car Garage. 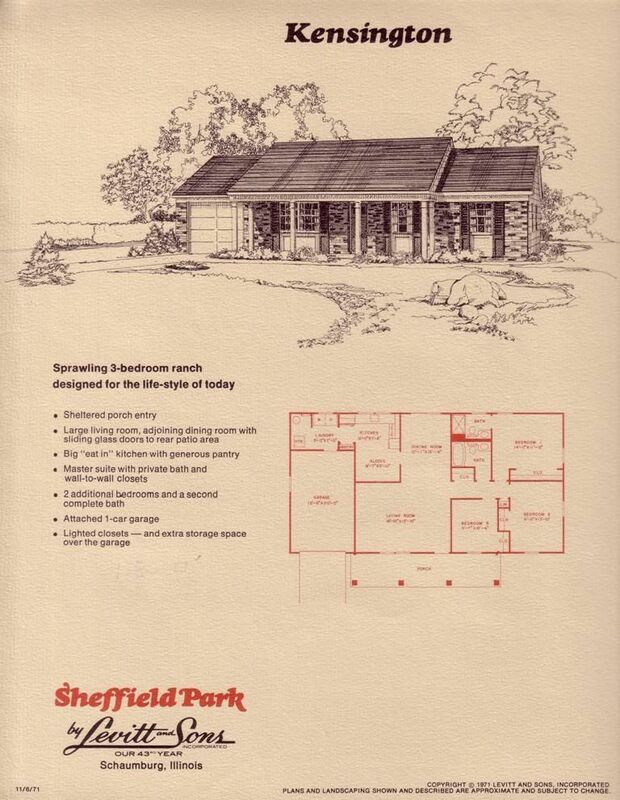 View press releases and news articles for Sheffield Park. 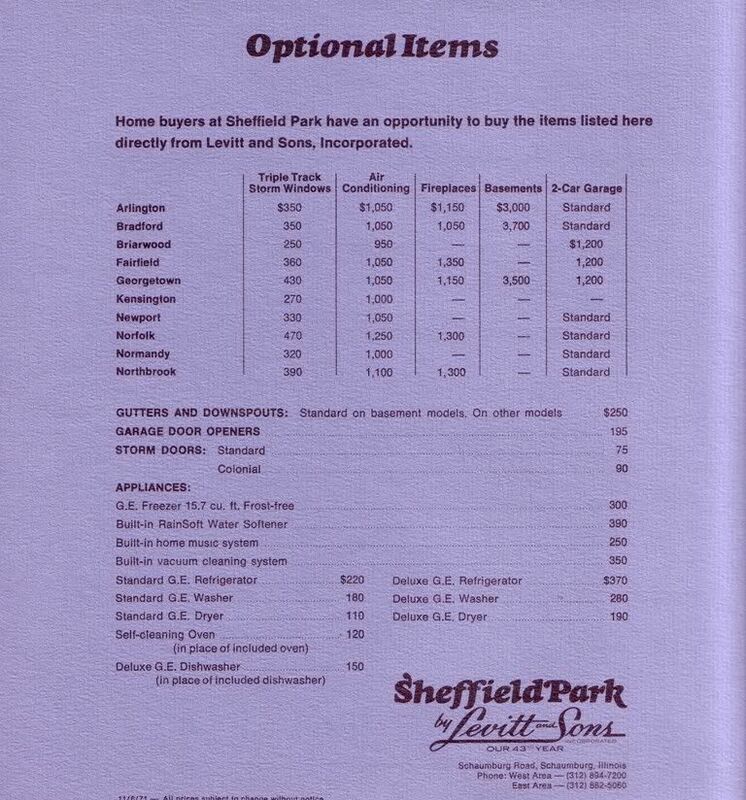 View original newspaper sales advertisements for Sheffield Park. 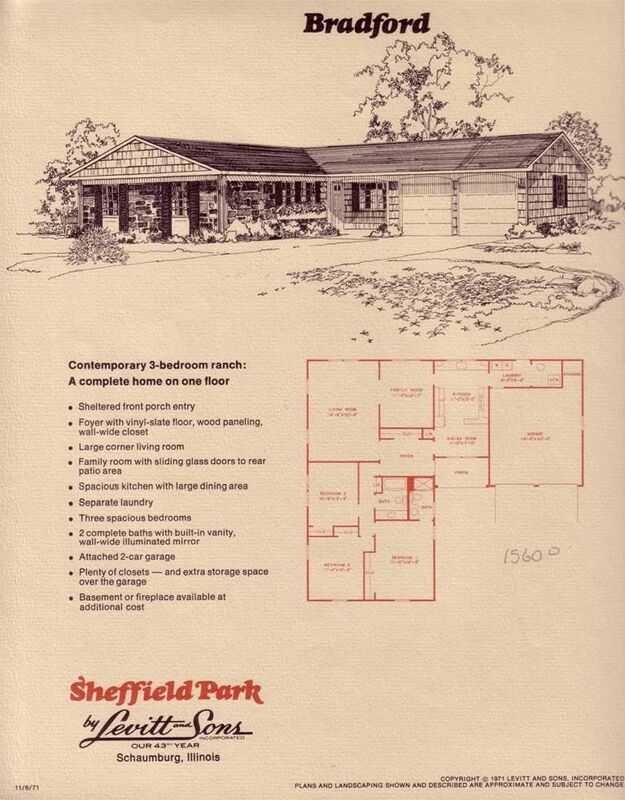 Beginning in late 1971, Sheffield Park created a second Exhibit Area one-half mile to the east of the original Exhibit Area with a completely separate houseline. 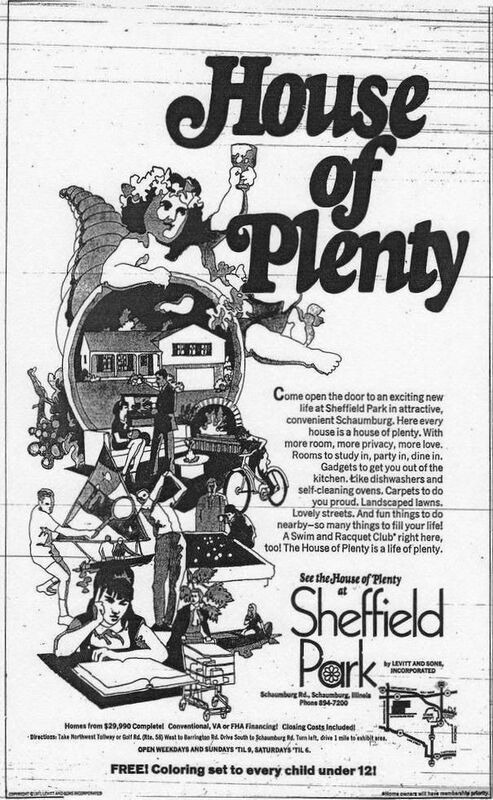 For a brief period, the communities were advertised separately, as Sheffield Park and Sheffield Park East. 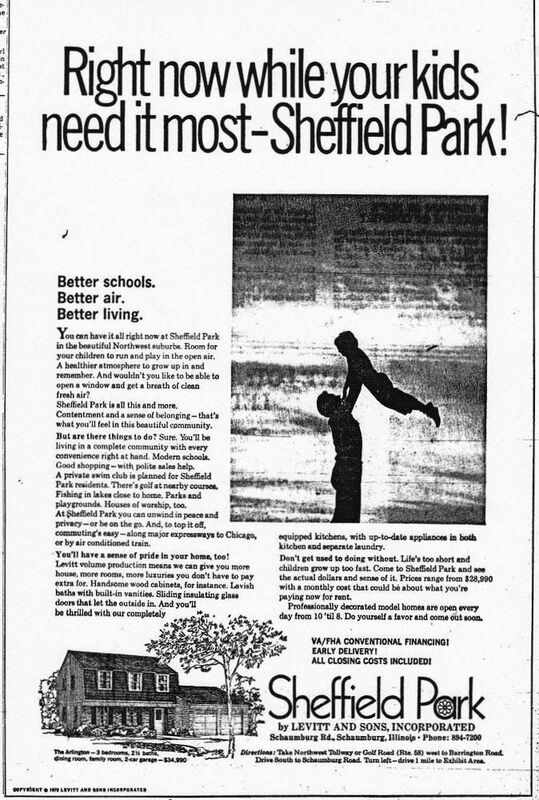 Eventually, the Sheffield Park East name was dropped in favor of continuing the overall community of Sheffield Park. 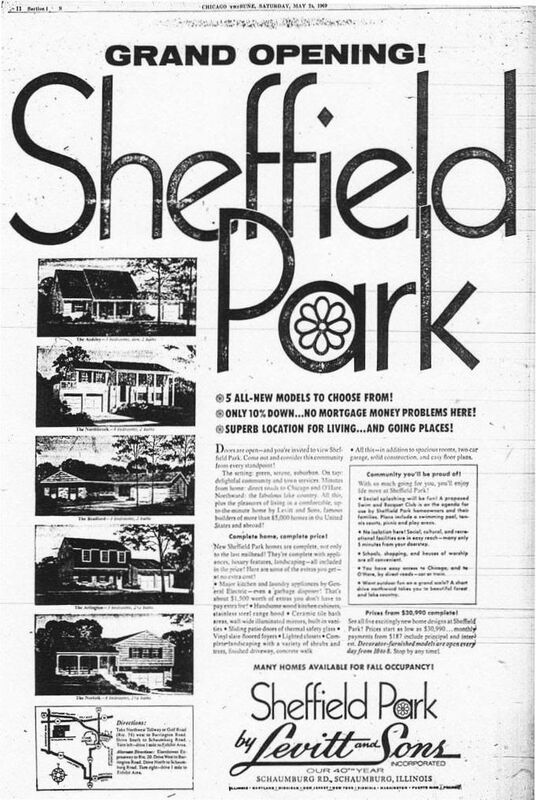 The West models contunued to be built in the last sections of the West area, while many of the West models were retained and built in the East area along with the East models as the next phases of Sheffield Park. 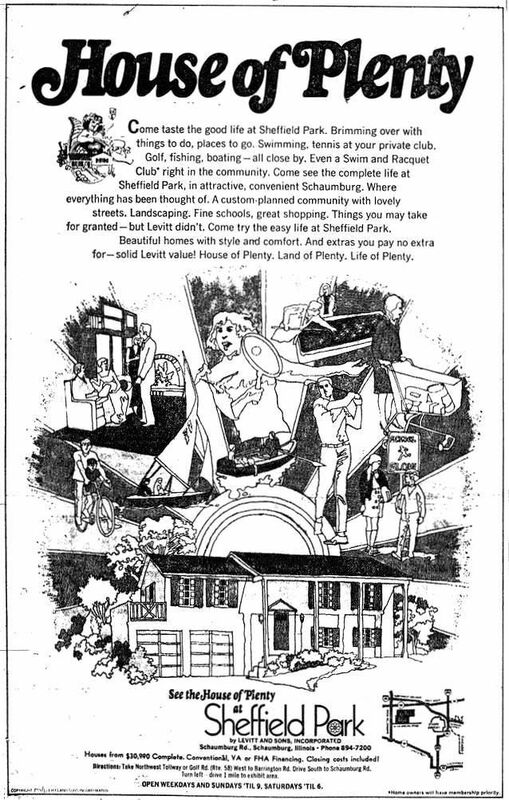 Note that in Sheffield Park, all of the features one might typically associate with a "complete" Levitt home were not necessarily included in the sale price of the homes. 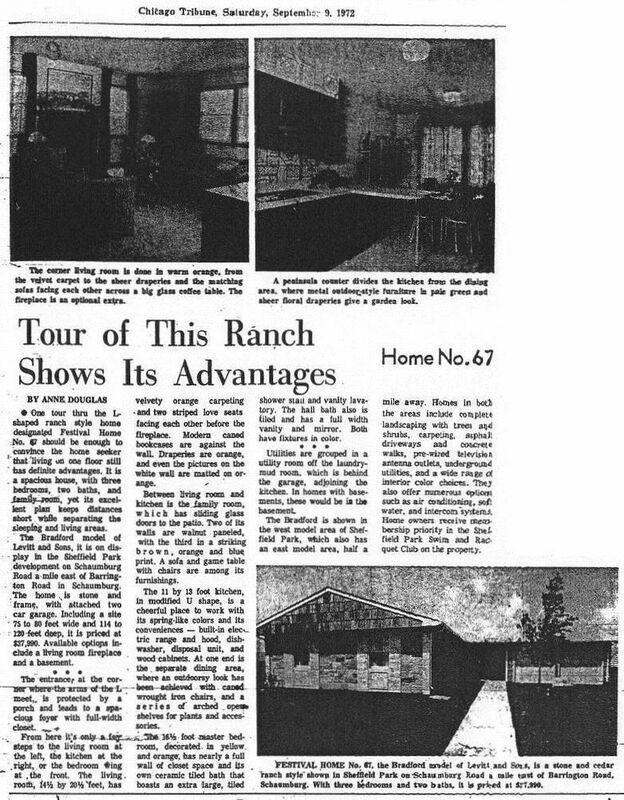 For instance, standard kitchen appliances included an oven-range, dishwasher, and disposer. 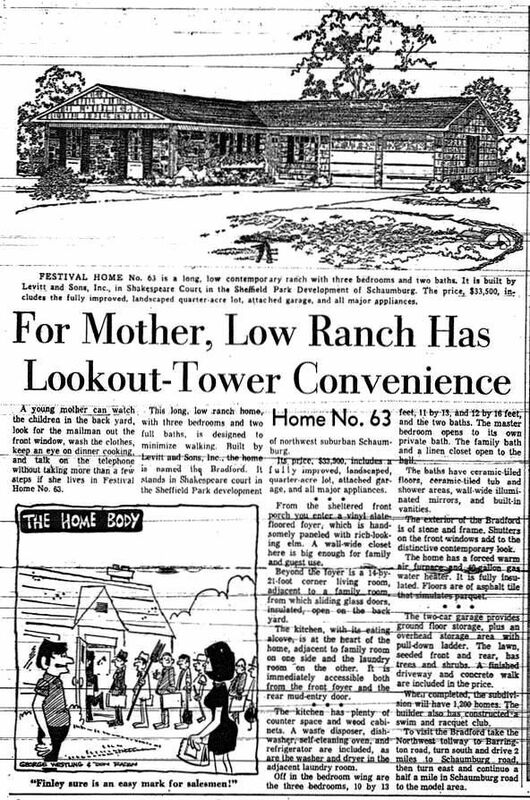 The refrigerator, washer, and dryer were available only as optional items and were not included in the standard appliance package, as they would have been included in price of the 1969 homes. 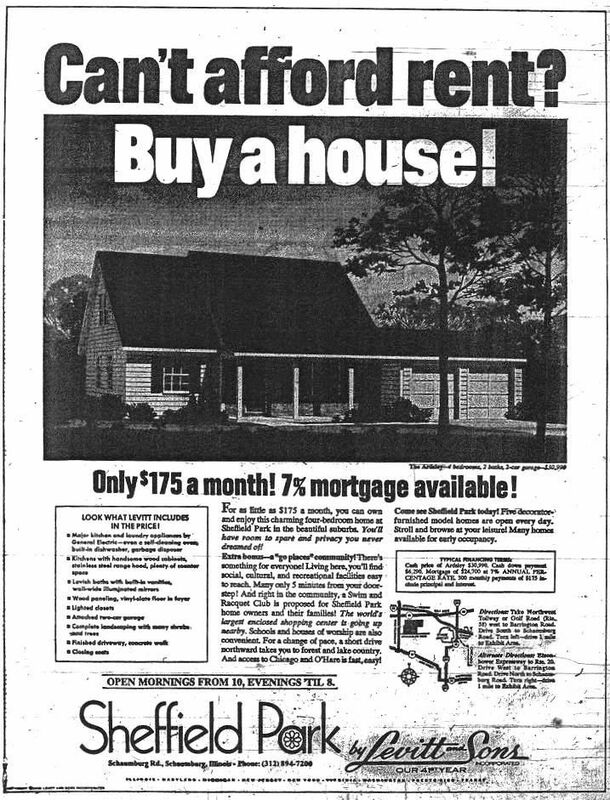 Upgraded versions of these items, as well as for the standard oven-range and dishwasher, were offered at additional cost that could be built into the purchase price and mortgage. However, carpeting was included in the living areas, stairs, and upper hallway, as were stained wood railings in place of the typical wrought-iron railing that were usually standard in other Levitt communities. 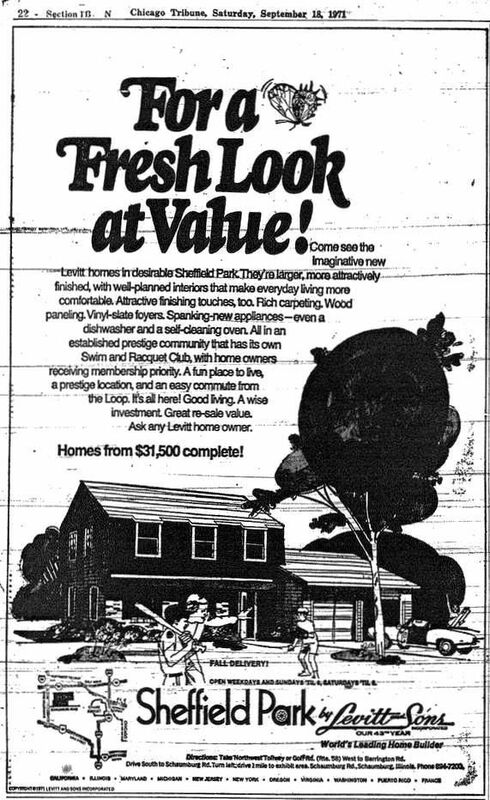 And in Levitt tradition, every home was thoughtfully situated on a fully landscaped homesite, complete with trees and shrubs. 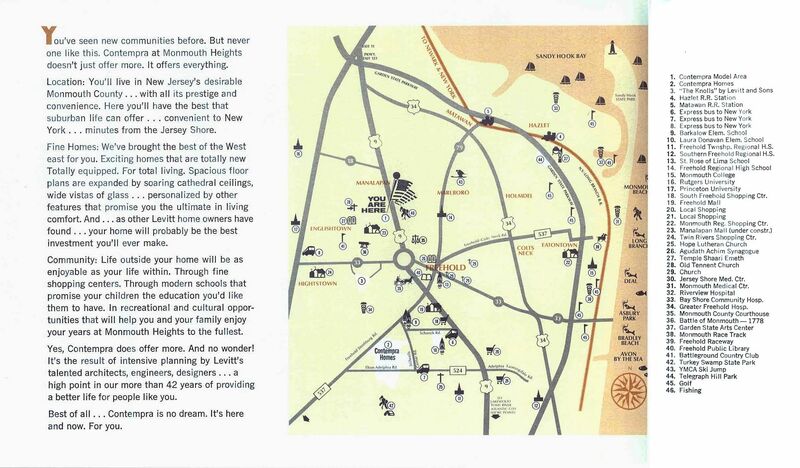 Note that with the 1972 homes, Levitt began to promote affordability directly instead of implicitly. 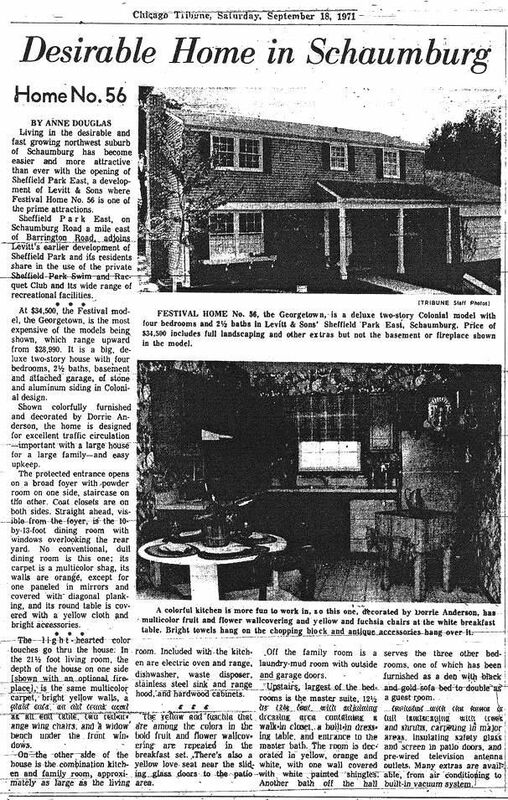 No longer was the primary focus on how "complete" the community and homes were, but rather on how affordable the homes could be. With an energy crisis and inflation looming, the housing market was likely beginning to feel the effects in terms of willingness of potential buyers to take a risk in the real estate market. 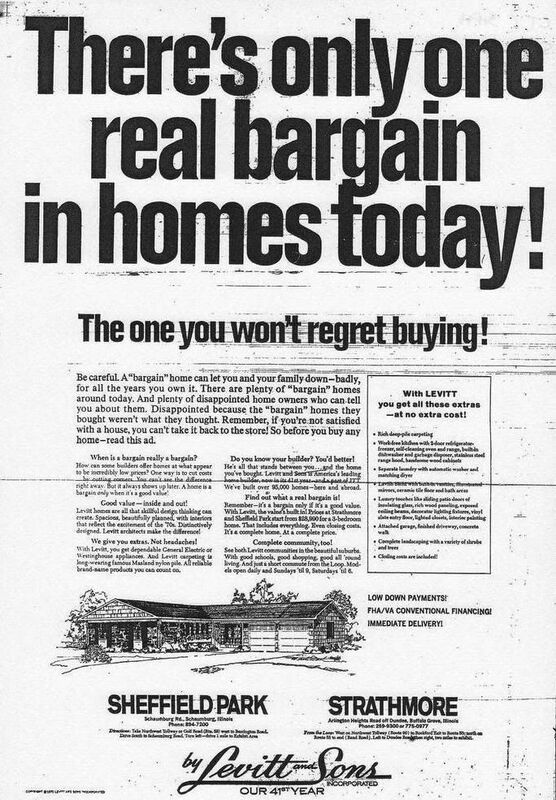 Note also that "The Affordables" were coupled with less standard equipment in the homes--namely appliances, which buyers might already own from a previous home. These exclusions undoubtedly kept the sale price under control, keeping the new housing market open to more buyers. Page last revised 23 February 2008.